Our rendition of the classic US Mail Bag that carried the nation's letters is a simple, vintage design like the original. We have added functionality with a main compartment divider to easily stow your laptop in the rear while multiple pockets & pen loops organize all of your essentials. There is a zippered pocket under the front flap while an outside magazine pocket on the back provides quick access to the necessities. 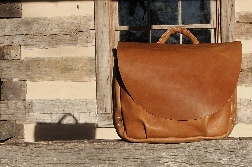 We have used a beautifully waxed leather to replicate the aged beauty of the original US Mail Bag. The copper rivets are the strongest rivets available & are what was used on the original Mail Bags. "Neither snow nor rain nor heat nor gloom of night stays these couriers from the swift completion of their appointed rounds" as the saying goes. Now you can have your own Replica US Mail Bag to carry your precious cargo through the elements. * Marine Grade, UV Resistant Polyester Thread For All Stitching. This Resists Sun, Salt Water & Chemicals. "This Mail Bag is simply gorgeous! It's rugged, handsome with tons of character and looks as if its already been used for years though I know it's new. The color is exactly what you would expect of an old mailbag. 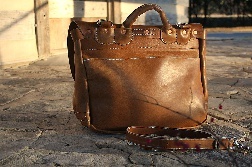 Texture of the leather is really wonderful and one doesn't feel like this bag has to be handled carefully." 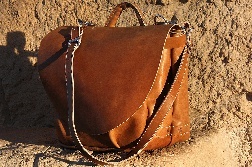 "Love this bag, great service. Nice leather, excellent construction,very spacious, nice shoulder strap w/ solid hardware. This bag will last! Thanks RL"